It's chilly, but bright and sunny. It's going to be a great day for running, and for the kid's to enjoy the jump houses and activities the race always provides plenty of. Francie Campbell and Annie Brothers watch Ariel for me as I head to the starting line. Anna and Robin are currently running the 5k together. I stretch well, get pumped up and pray beforehand, reminding myself that the goal is always to give glory, credit and thanks to God. Go! Good start. Nice and steady. I want to break 40 but, again, have forgotten what the pace is. 6:30? Recently we ran 1 mile time-trials at the Tuesday track workout and I was surprised how fast I was able to go with everyone supporting. It's such a confidence builder knowing I did a 5:30 mile and only have to do 6:30's today. Mile 1: 6:31. Wow, I was kind of pushing it and still didn't get 6:30. This is going to be harder than I thought. I bear down for the long northern straight section. I start feeling my left hamstring pulling. I either have to slow down or think of something to ease the strain on it. 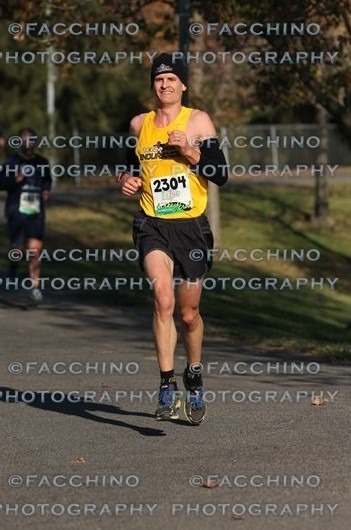 I try a shorter stride but it doesn't help. Then I remember studying treadmill running and how most of the effort isn't pushing forward, but pulling the leg behind you to in front of you. My right leg is the strongest, and therefore heaviest, and probably pulls through slower. So I try pulling it through faster and, sure enough, my left hamstring stops hurting as much. Thanks, God! Mile 2: 6:29. Ok, this is good but I've got to go even faster. I focus on running the tangents and catching people ahead of me. I also drink at every aid station. I continue emphasizing my right leg pull-through. Using my stomach muscles more helps. And somehow my miles continue to get faster..
Mile 3 6:19. This is great! As I think about the 40min goal I'm realizing the pace needed is more like 6:23. I'm only at 6:26 average currently. Gotta keep picking it up. The course at this race is great. A lot of scenic, winding paths that keep your mind occupied wondering where you are. I'm 1/2 way and determined to keep up the effort needed to meet the goal. I remain very thankful that God is helping my hamstring feel good. Mile 4: 6:19. Getting closer.. my average is now 6:24. Ok, this is the "working mile".. use the arms, pull through with the leg, get over the overpass… and then I can just bear-down, stop looking at my watch, and give everything I've got for the last, straight mile. Mile 5: 6:17. Terrific! Ok, I switch my watch display so I don't see the pace and just the time instead. I know Robin and the girls will be cheering me in and watching the clock. 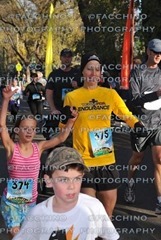 I know I'll make it if I keep up my best effort..
Mile 6: 6:15. Almost there.. can't wait to be done.. I high five the girls and finish! 39:52. I even won my age group and got some prizes which was completely unexpected. Thanks, God : ) Just never know what can happen. I've been thinking about my race for a few days. I did some stretches. I did some running at the track on Tuesday's. Go! The race has started. Daddy is with me. We ran. Dad gets ahead of me. 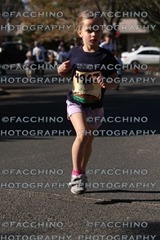 I felt like I was running good. I liked that Daddy was helping me and telling me I'm doing good. After .5mi, my body started feeling like it wanted to stop. 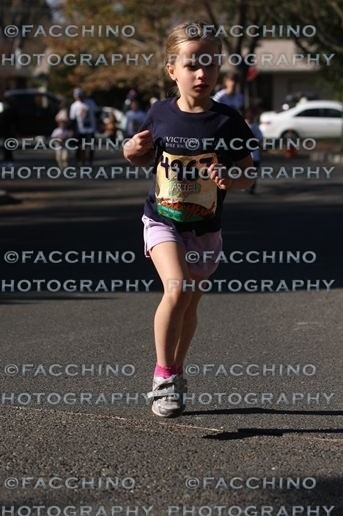 But then we ran again and I ran the whole race. 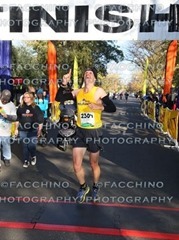 Then I turned the corner to go to the finish and that felt good. I got to the finish line. I got a ribbon. I got to eat food. I also got water. That's all. Ready to go! We lined up and the announcer said go! We started running. I was touching the cones on the road for a little bit. Then I saw Dad running on the sidewalk and I said hi. Then I gave him my sweatshirt because I was hot. He ran back to the starting line so he can do his race. Then my legs started to get sore. They really, really hurt. But Mom said to keep it up and I made it to the aid station. I drank some water and poured the rest on my head. I started running again with Mom and my legs still hurt. 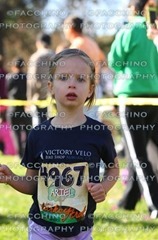 Then we turned down the street and mom said the finish line was down the road. I saw kids I could pass on the way. And, I was getting closer. When I was almost there Mom and I held hands and crossed the finish line together. At the end I got food and a massage from Daddy. That was my favorite part! Only 45F this morning but still good opportunity to start experimenting with cold weather wear. Swam. Water was warm. Changed into rash guard, thick wool sweater, plastic rain jacket, baclava, long tights, wool socks, long finger gloves. Was perfect. Little warm after 12 mi. Temp probably 49F then.